Yeah yeah, I know, I know I’m lame. I didn’t have the time for two reasons. But, see that top photo? 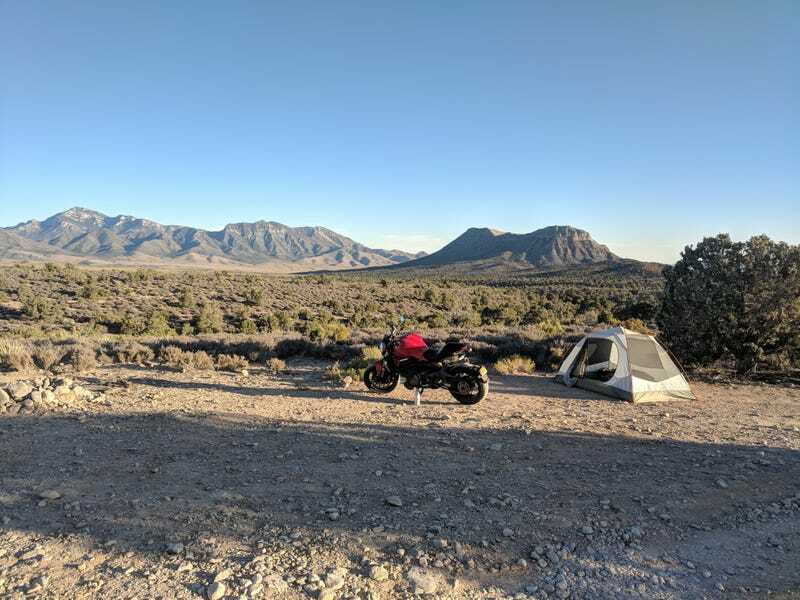 It’s my favorite campsite of the whole trip! Anyways... At this point, I was already over my estimated mileage for the whole trip and my rear tire was bald. But I still had over a thousand miles to go. Las Vegas happened to be the only city even close to the route I wanted to take, so it was Vegas or bust [a rear tire] for me! Not only that but a friend from school, elementary through the end of high school, lives there and we planned on grabbing lunch and catching up. Because of my time constraints I stuck to the interstate as much as possible for this leg, and it’s where I experienced the hottest temperature, 106 degrees. Took about 2 bottles of Brawndo every 45 minutes to keep from dying of heat stroke or dehydration. But I made it and we had lunch at the cracker barrel and I avoided the strip. Been there done that. After lunch I made my way to Las Vegas Ducati where Xavier hooked up this waiter walk-in with a new rear tire. Good price and fast service. And on top of that, he let me use a phone charger since the heat had my phone charging just enough to not die. Plus, he kept me hydrated while I waited. Only one problem. A bunch of Multistradas had come through recently and cleaned out their stock of scorpion trails. They only had one tire in my size. Pirelli Rosso Corsa 3. Ugh. Ok. I’ll deal. Beggars can’t be choosers. If it didn’t give me enough dirt traction I could just pin the throttle to make up the difference, right? I mean that’s what all the southerners do in the snow! Some of the roads in here? Not for the faint of heart or low of suspension. The main road in is fine, but some of the side roads to individual campsites could easily claim your oil pan for its own if you’re not careful. And that was that. Only one post left!